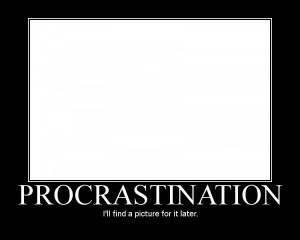 Here’s an interesting study that confirms what you already know about procrastination. You’re better off spacing out your work with self-imposed deadlines, if you want to avoid waiting until the last minute. English teachers know this well, and that’s why they explicitly break up phases of a longer-term research paper into smaller, more regular milestones. They set up three classes, and each had three weeks to finish three papers. Class A had to turn in all three papers on the last day of class, Class B had to pick three different deadlines and stick to them, and Class C had to turn in one paper a week. Which class had the better grades? Class C, the one with three specific deadlines, did the best. Class B, which had to pick deadlines ahead of time but had complete freedom, did the second best, and the group whose only deadline was the last day, Class A, did the worst.